When warmer weather approaches, it's a good time to review how higher temperatures affect odor generation. First, volatile compounds - the source of most odors - are more easily airborne as room temperatures increase. Second, bacteria grow quickly as temperatures rise, so carpet that has no perceptible odor before you arrive might soon, especially after a hot water extraction. This is why, for example, an area of carpet soiled by a pet in the winter might not be noticed until the warmer temperatures of spring. And when you clean a hidden urine spot with hot water, the heat and moisture provide nourishment to the bacteria that feed on urine residues and they start to multiply. Bacteria also feed off of food residues, such as a glass of milk spilled in the winter that was blotted, but not thoroughly cleaned. 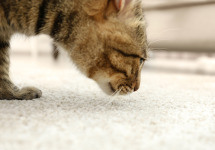 This type of soil can smell sour after carpet cleaning. Bacteria can multiply very quickly once activated, and so do the odors associated with them. Of course, the customer will assume that your cleaning is the cause of the odors. Before you clean, ask about the carpet's history and look for signs of soils, especially when the homeowner has pets or children. A moisture detection tool will signal the presence of urine, because urine salts retain moisture. If odor does appear after you clean, try to find the exact location or source. It might be an isolated spot that you can easily treat and be your customer's hero!